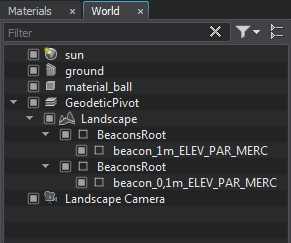 To create a terrain based on the real world geodata, perform the steps described in the chapters below. The geo-referenced terrain can be created only in the Sim version of UNIGINE SDK. Create a terrain based on ordinary images only (with no geo referencing). Create a terrain based on both the sources with no geodata and the geo-referenced ones. Height (Elevation) (optional) - this type of data is used to generate terrain geometry. Albedo (Imagery) - this type of data is used to generate textures for the terrain surface. Masks (Landcover) (optional) - this type of data is used to generate natural features of the landscape (details, grass, trees, etc.). Vector (optional) - this type of data is used to generate roads, communications, buildings, landmarks, etc. Procedural (optional) - this type of data is used for procedural refinement. It is recommended to use WGS84 "Geographic" projection (latitude/longitude) data sources to increase terrain generation speed up to 30%. To add a new source, click the Add Source button. The imagery, elevation, landcover, vector or procedural layer of the data source. The name of the layer that will be displayed in the Sources panel. To specify the geodata source, choose the geo-referenced type in the drop-down list and click the ... button to specify the path. To specify the ordinary image(s) with no geodata, choose the source tileset type and click ... to specify the path. Check the Create a Terrain article to learn more about loading source tilesets. The unnecessary runtime files will be generated. You won't be able to load such files as data sources as the engine file system will use the generated runtimes instead. For example, if you specify a .tif file, the file system will load the generated .dds runtime file that doesn't supported. 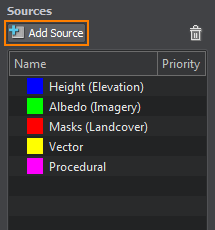 When you add the imagery, elevation, landcover, vector or procedural data sources to the Landscape tool, their areas will be highlighted on the Preview panel with corresponding colors: blue for elevation, green for imagery, red for landcover, yellow for vector and magenta for procedural. Area size of procedural sources is adjustable. To delete the selected data source, press or right-click the source and choose Delete in the drop-down list. When you select a data source, you can see its parameters in the Parameters panel. Depending on the type of the data source, the contents of this panel differs. 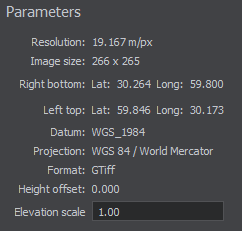 The scale factor used for elevation data. The parameters of the sources with no geodata are described here. The color to be used for areas with no data available. Landcover geodata/no geodata source parameters are described here. This type of data source is optional and should be added when generation of terrain details or vegetation is needed. It allows specifying both the geo-referenced and non-georeferenced sources. Vector geodata source parameters are described here. This type of data source is optional and should be added when generation of roads, communications, buildings, landmarks, etc. is needed. It allows specifying only the geo-referenced sources. Procedural geodata source parameters are described here. This type of data source is optional and should be added when it is necessary to refine data from elevation, landcover or other procedural data sources. You can specify processing order for all data sources except the vector ones. This can be done either using the Processing order field of the data source, or via Processing Priority in the Settings panel. At this step you can check out the parameters of Terrain LODs to be generated for all data layers (elevation, imagery, normal, and detail masks) and determine the natural features of the landscape. 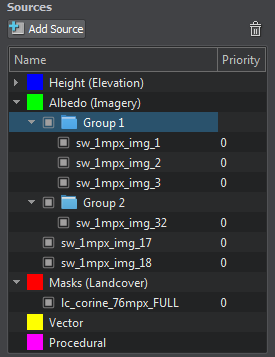 To access LOD settings of the particular data layer of your terrain, select the data source group in the list: all available settings will be displayed on the Parameters panel. 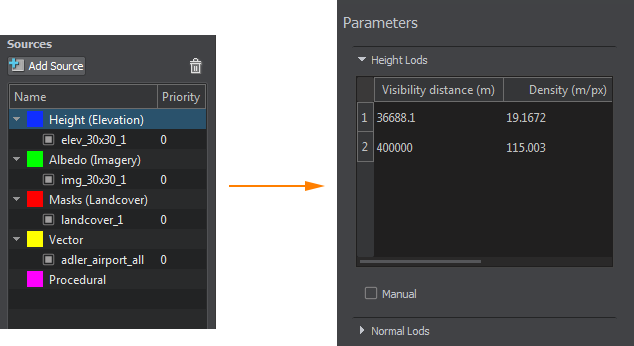 The Landscape Tool sets the number of LODs, their visibility distances and densities automatically. You can change these settings when necessary. 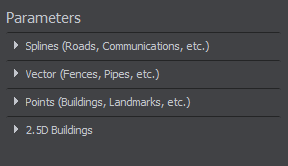 To modify LOD settings for the desired data layer you should set Manual mode by checking the corresponding option located just under the list of LODs (see the picture below). 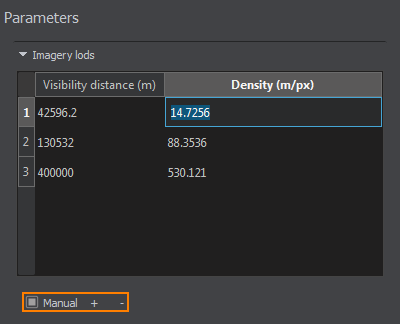 In the manual mode you can modify density and visibility distance values by simply double-clicking on the corresponding cell and entering the desired value. Use + (plus) button to add a LOD, or - (minus) to remove one. In the manual mode, the LOD density should be specified more accurate, as this value determines the size of the tileset of the generated LOD: the higher the LOD density, the bigger the LOD tileset (the density is multiplied by 128 (the size of a single tile)). Specifying high values may lead to visual artifacts at the edges of the terrain. 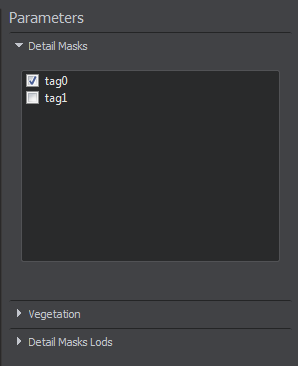 Terrain detail masks - the tags specified for landcover data sources that determine the areas for terrain details to be placed. Vegetation (grass, trees, etc.) - Grass, Mesh Clutter, and World Clutter objects will be generated and placed in certain areas of the terrain according to specified landcover tags. You may skip this step, if you don't need procedural generation of natural features of the landscape for your project. At this step you can determine which cultural features of the landscape are to be generated: roads, communications, fences, pipes, buildings, landmarks, etc. You may skip this step, if you don't need procedural generation of cultural features of the landscape for your project. Spline (Roads, Communications, etc.) - objects of this type are stretched or tiled along Bezier splines. Vector (Fences, Pipes, etc.) - objects of this type are generated and placed along vectors. Point (Buildings, Landmarks, etc.) - objects of this type are generated and placed at certain points. 2.5D Buildings - objects of this type are generated on the basis of Open Street Maps (OSM). Georeferenced - the terrain is based on the geodata sources. 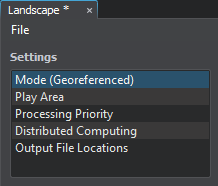 This mode should be set for geo-referenced terrain generation, even if the geodata sources are used along with the sources with no geodata. Flat - the terrain is based on the raster images with no geodata. If enabled, the capability to load the geo-referenced data sources is disabled. The Flat mode can be useful when you need to generate the terrain based only on raster images with no geodata in the Sim version of UNIGINE SDK. Built-In (Geodetic Pivot) projection based on WGS-84 ellipsoid. Custom projection that is used for data with a custom source projection (not WGS-84 ellipsoid-based) saved by using a 3rd party software (e.g., CityEngine). Such projection should be described in the WKT (Well Known Text) format stored in .prj files (e.g., it can be generated in Global Mapper). The terrain generated with the custom projections cannot be curved. In the Flat mode, no reprojection is performed. If for some reasons, you haven't specified this mode and have loaded only the sources with no geodata, reprojection won't be performed anyway. If you use both sources with no geodata and geo-referenced ones for terrain generation, you should choose the Georeferenced mode and specify the output projection. At that, no reprojection will be performed for the non-georeferenced data sources. Play Area is a rectangular area of a landscape to be generated. Play Area represents a gray outlined rectangular area in the Preview panel. Depending on the type of the output projection, it can look like a trapezium near the terrestrial poles due to the equirectangular projection, or it can be rectangular (if the Flat mode is set). Play Area's central point coordinates. The maximum visibility distance of the Play Area in kilometres. Here you can specify the order in which data sources will be processed. For details, check the Create a Terrain article. Here you can set up distributed computing to be used for terrain generation. For details, check the Distributed Computing article. Here you can specify the output path for your terrain data and cache parameters. 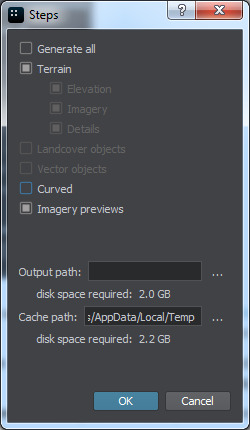 When the Landscape tool faces a large amount of source data, it automatically cuts the data to small tiles and uses them as cache. The cache is used to speed up subsequent terrain re-generation. Landscape tool doesn't clear the cache automatically, you should do it manually if necessary. When clearing the cache remember, that next terrain re-generation will require more time. Output path for generated terrain files. By default, a new folder in your project's data folder will be created. The Landscape Tool stores the paths to all data sources as well as all generation parameters in an asset. So, after setting up all these parameters, you should save them by choosing File -> Save Asset and specifying the name and path for your asset. Now you can generate the terrain by clicking the Generate button. In the Generation Steps window, that appears, you can select what is to be generated. You can modify these options each time you need to re-generate specific part of the terrain data, saving the time required for regeneration of the whole terrain. The whole terrain with detail masks, landcover objects and vector objects (spline, vector, and point) will be generated. This option is selected by default. Only landcover objects will be generated. Only vector objects will be generated. The flag indicating if the generated terrain should be curved (WGS-84 ellipsoid datum). Landscape tool uses WGS-84 ellipsoid by default. After terrain generation, you can specify the Geodetic Pivot object's settings and choose another ellipsoid reference (including custom). The flag indicating if imagery previews are to be generated and placed at the corresponding location on the map displayed on the Preview panel. Thus, you can mark areas of the global map for which the terrain was generated. Also you can specify or change the output path for your terrain data and cache parameters. If you have any unsaved changes, then after clicking OK in the Generation Steps window, you will see the window for saving the asset. Specify the name and the path for your asset and click Save. The generation status window will appear. After successful generation process, the Landscape tool may offer your world settings optimizations. We recommend you to apply them, however, you can ignore. The landscape_geodetic_pivot Geodetic Pivot object for curving the terrain according to WGS-84 ellipsoid. Beacons - NodeDummy objects generated for all elevation sources in the Play Area. These beacons can be used to quickly move to certain terrain location. The Landscape Camera camera object which is placed in the center point of the terrain with specified all the necessary parameters (far and near clipping planes). 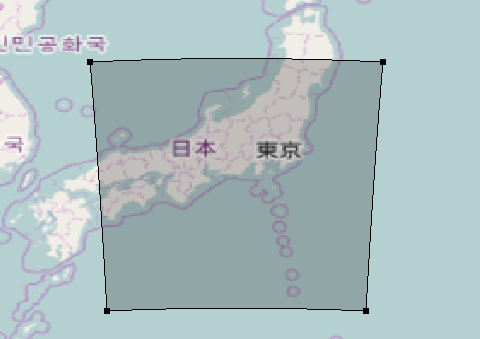 The coordinate system for generated terrain is Cartesian ENU (east-north-up) with the origin taken from the play area center in Landscape tool. 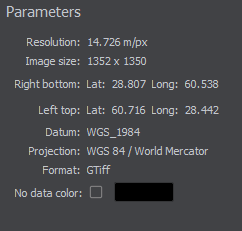 If you're using Global Mapper, current projection can be obtained using orthographic projection, datum 84, and CENTRAL_LONGITUDE / LATITUDE parameters set equal to your play area center.